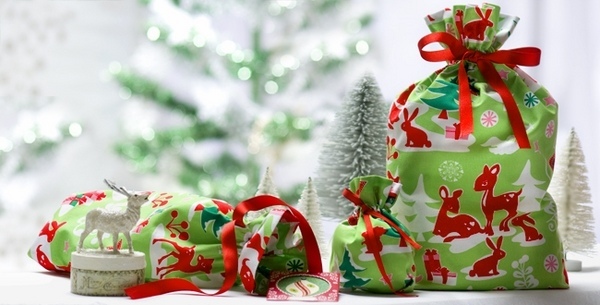 DIY Christmas gift wrapping ideas are changing every year and we see more and more interesting wraps and gift toppers crafted with lots of creativity and imagination. 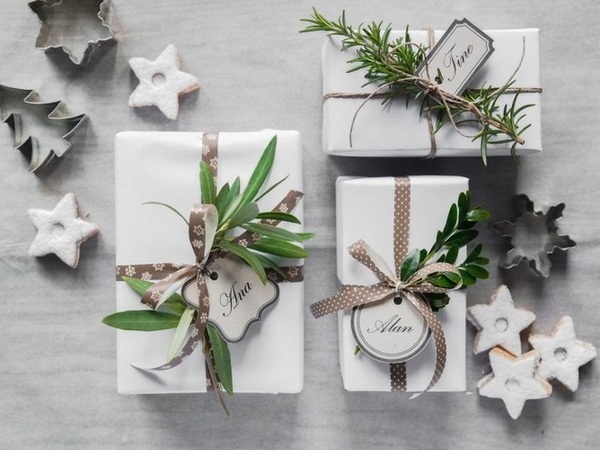 You may have noticed that for the last few years there is a strong trend towards eco-friendly gift wrapping and toppers and many people prefer to wrap the presents for family and friends by themselves. 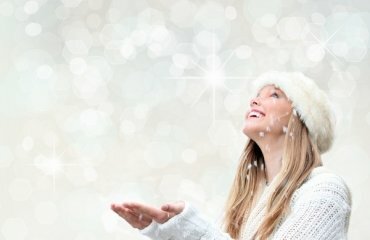 We all realize that any gift given from the heart is causing a lot of positive emotions and whether it is cheap or expensive becomes irrelevant. 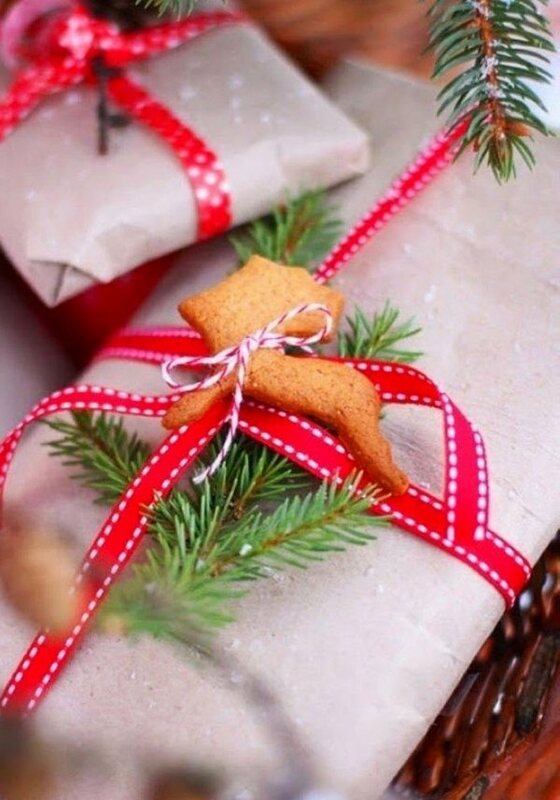 Christmas gift wrapping is a special process, even a ritual, because Christmas holidays are full of unique warmth and energy. 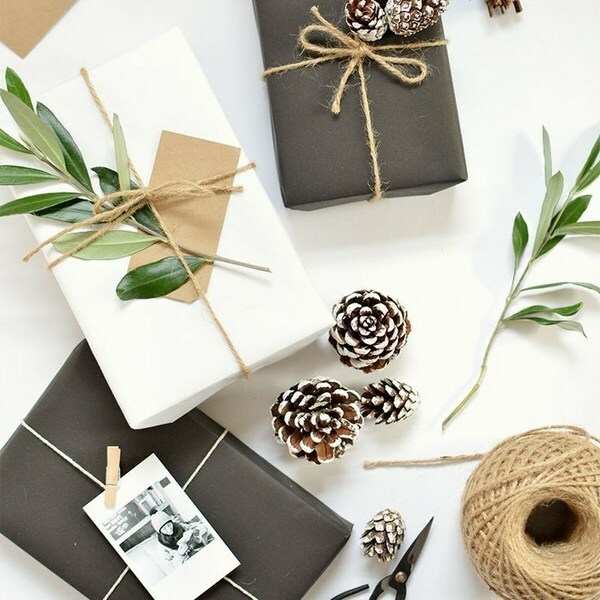 You can choose very simple DIY Christmas gift wrapping ideas, you may be skilled at crafting and opt for elaborate toppers and richly decorated presents and the images below will give you a lot of inspiration. 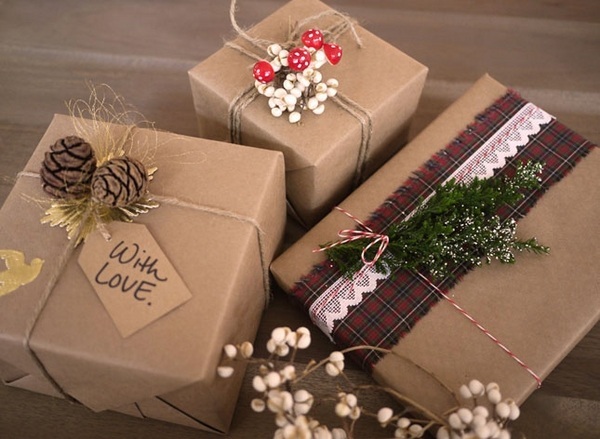 To many people giving gifts is much more pleasant than receiving them, because giving a gift, decorated with love, will bring much more joy to friends and family and you can express your sincere feelings, care and attention. 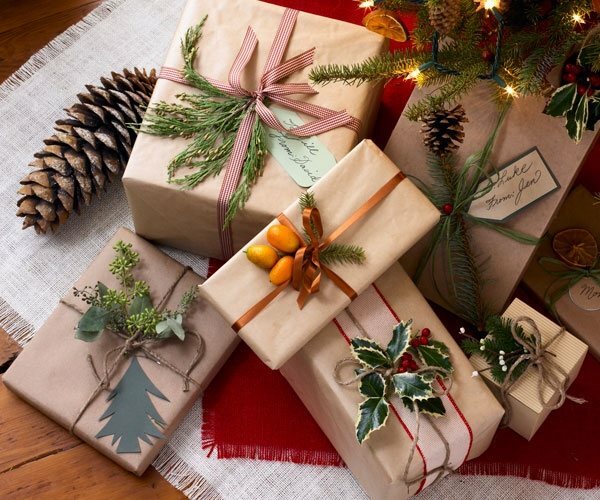 Gift wrapping is an art in itself and when it comes to Christmas gifts, we see glamorous and sparkling wrappings – multicolored paper, silk ribbons, original toppers- all these add to the magic of the holiday season! 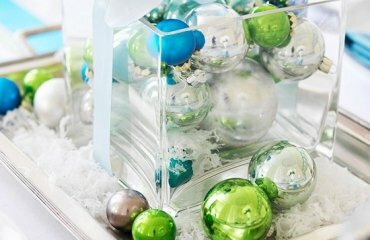 Surprise your loved ones with gifts for Christmas, packed in an original way and show your creativity and personal attention. 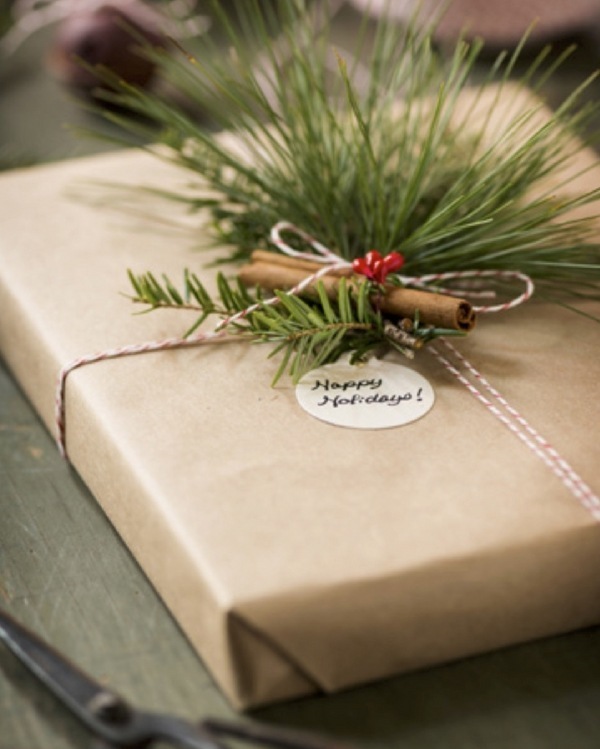 Why should you choose eco-friendly natural materials for your Christmas gift wrapping? 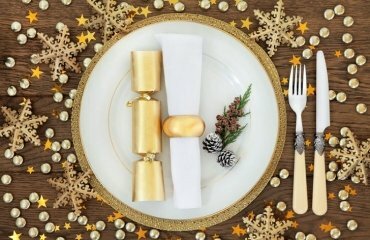 There are many reasons why people choose to use natural materials and the fact that it is trendy or fashionable is the last one. 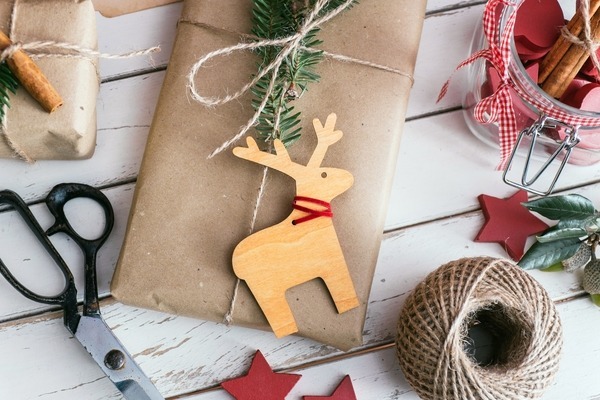 On the first place, these materials are really easy to find – just take a stroll and gather acorns, pine cones, fir twigs, dry branches or some berries from the park or the forest. It is very easy to dry slices of fruits and use them for decorations. 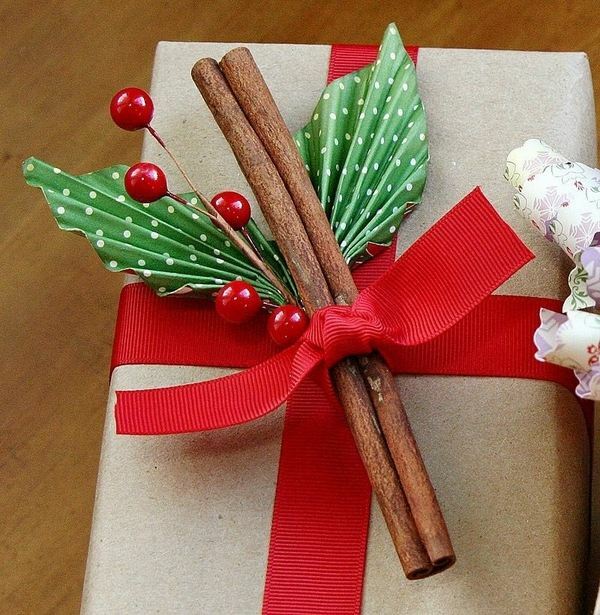 Herbs like rosemary and cinnamon add a pleasant scent and make the present even more charming. 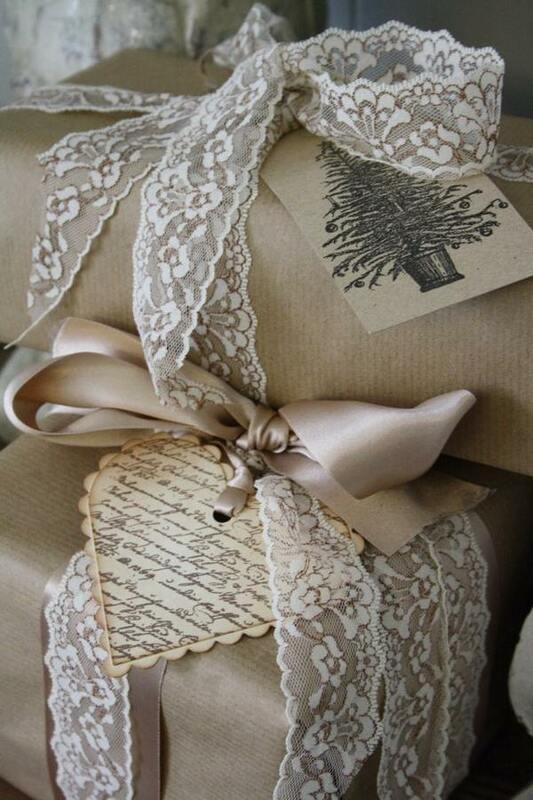 You can use pieces of lace, remnants from colorful fabric, brown paper, even old newspapers or music sheets to craft original gift wrapping and these simple, accessible materials when beautifully combined, will allow you to create exceptionally wrapped Christmas gifts. 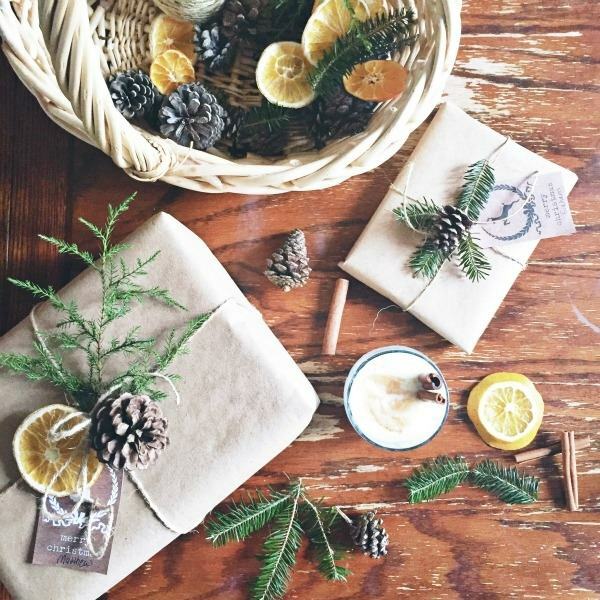 DIY Christmas gift wrapping ideas with natural materials are a good choice when you want to give your gifts a rustic appearance, vintage flair, Shabby Chic elegance, primitive aesthetics and even a minimalist look. 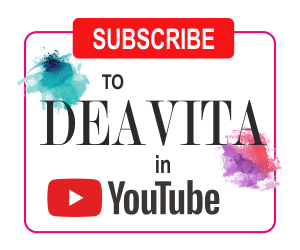 Fans of minimalism know very well that “Less is more”, while those who are attracted to a more romantic look will be fascinated by the combinations of linen, lace and paper. 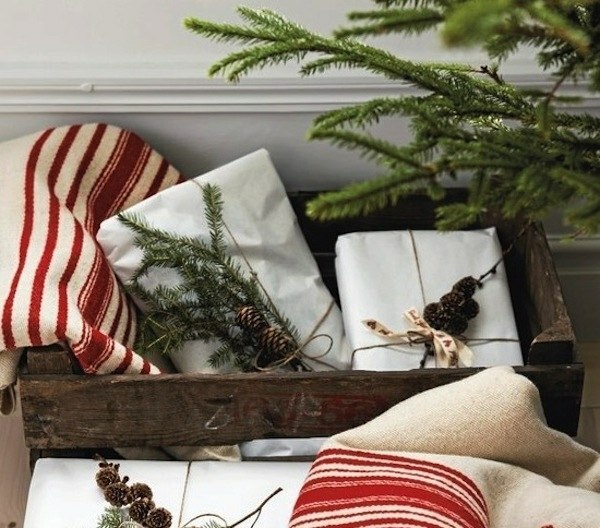 You can choose different color schemes as well – red and white, accented by green twigs or plain paper and a simple tape to create a monochrome design. 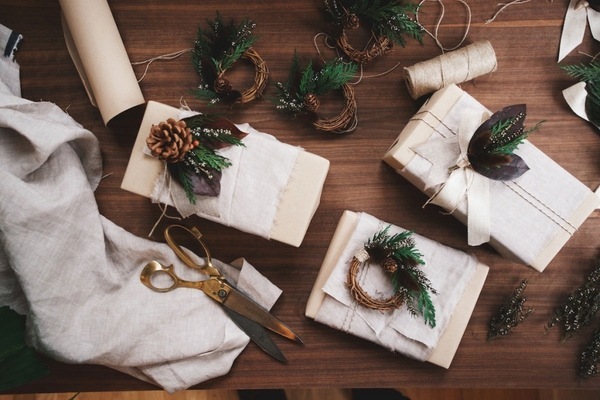 DIY Christmas gift wrapping ideas with natural materials have the advantage that will never cause embarrassment for being too glamorous, too sparkling or just “too much everything”. 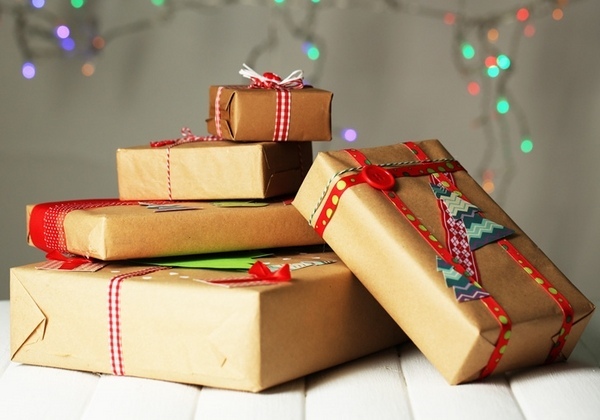 The tradition of Christmas present wrapping is relatively new. 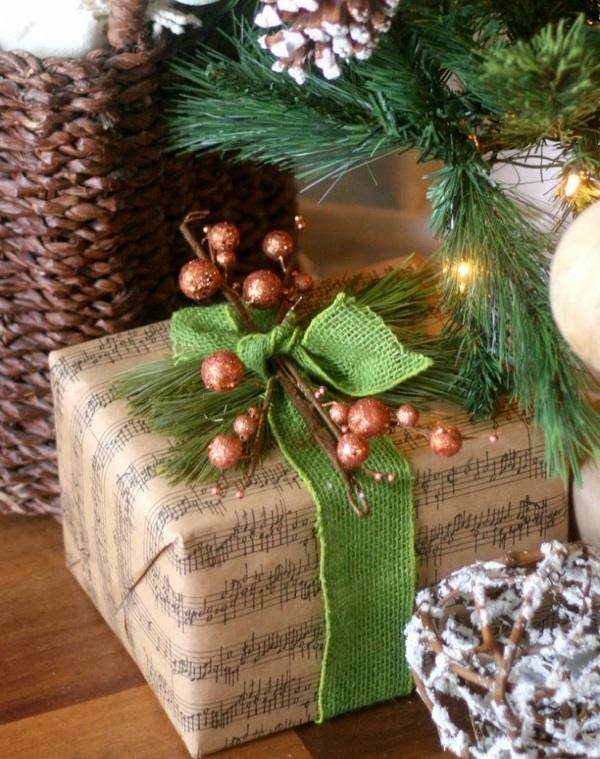 Before the end of the XIX century gifts were given completely open but manufacturers saw an opportunity for a new trade and patterned paper appeared, colored ribbons, etc. which were a great success. 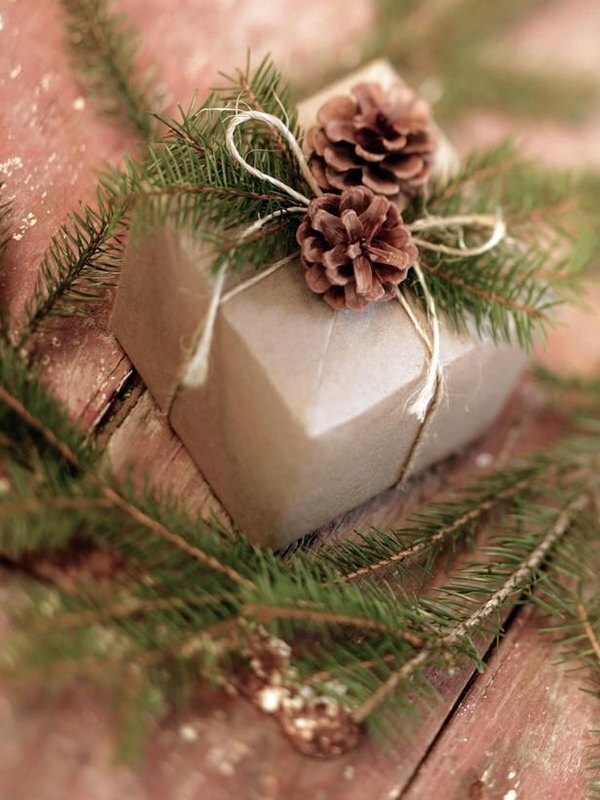 Nowadays, the return to the times of simplicity and natural materials when gifts were given for a reason is obvious, and to many people this is a way to get rid of additional stress and headaches during the holiday season but return the feeling of true Christmas magic. 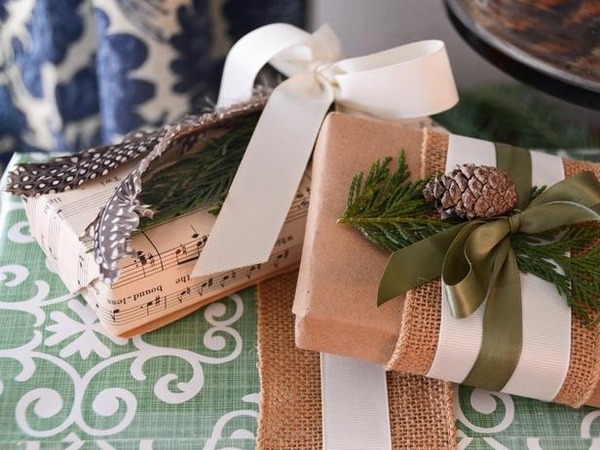 When choosing the materials, the colors, style and theme for your DIY Christmas gift wrapping ideas you should not be afraid to experiment. Creative ideas are focused on how much we are willing to pay attention to another person. 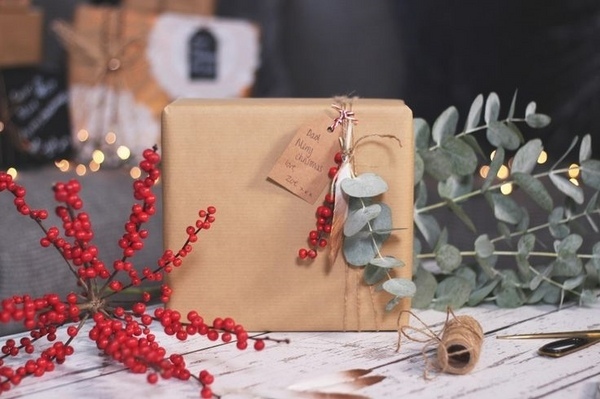 Brown paper, which often serves as a cheap packing material, looks natural and not too pompous and with the right decoration is wonderful for original packing. 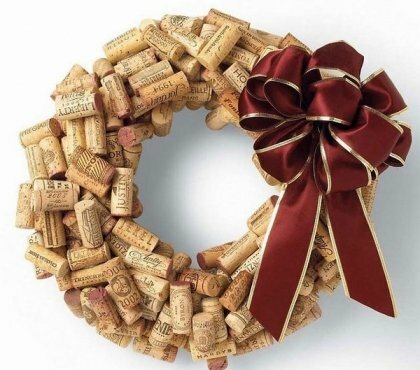 It can be found in every craft store or bookstore and can be quickly shaped and cut. Besides, it is quite tight and can not be easily torn. 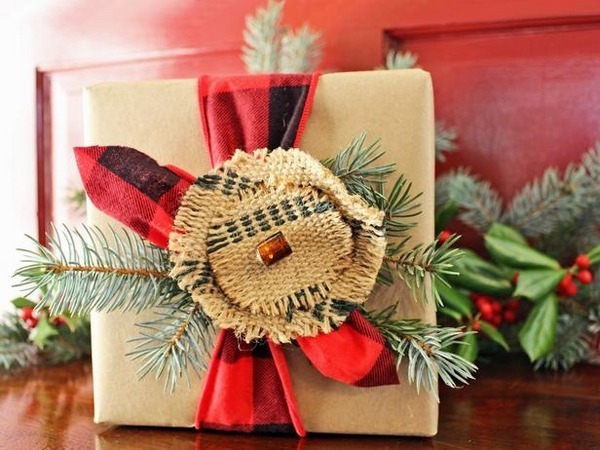 Brown paper is easily stamped and you can buy special Christmas stamps from craft stores or make them by yourself – simply cut the desired shape in a potato and apply color on it. 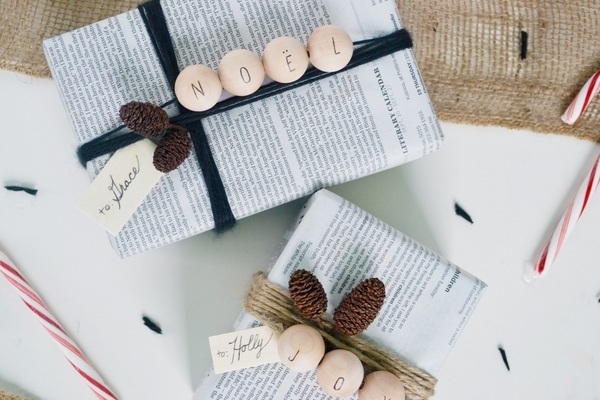 You can use the stamp to decorate Christmas cards and gift tags as well. 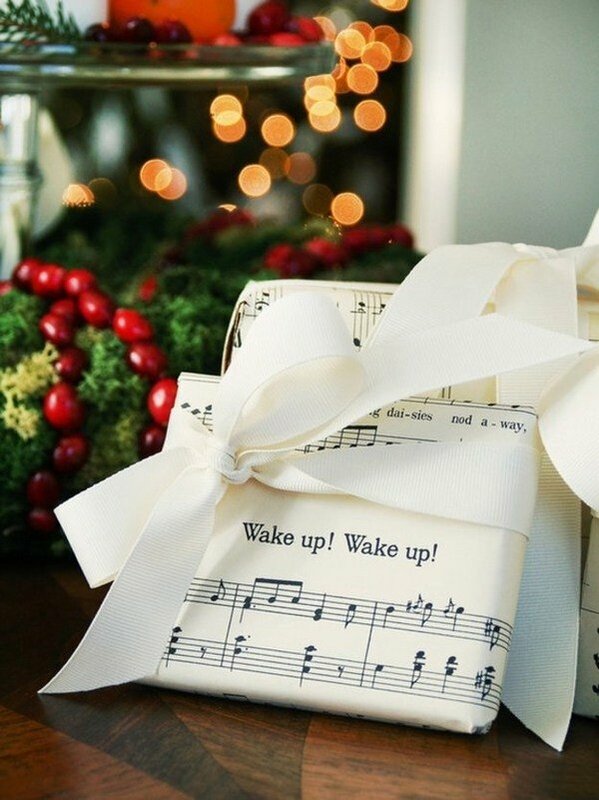 Newspapers and music sheets – another original options and great materials for DIY Christmas gift wrapping ideas. 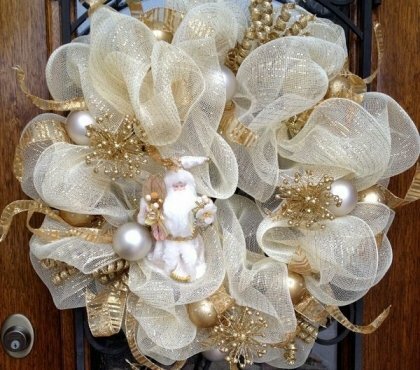 These are excellent when you want to add a vintage flair and can be decorated with simple cotton or burlap ribbons, doilies, etc. 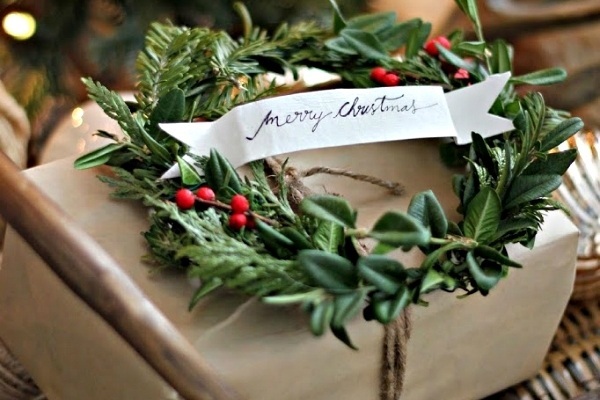 You can even recycle old Christmas cards and craft beautiful Christmas gift toppers. 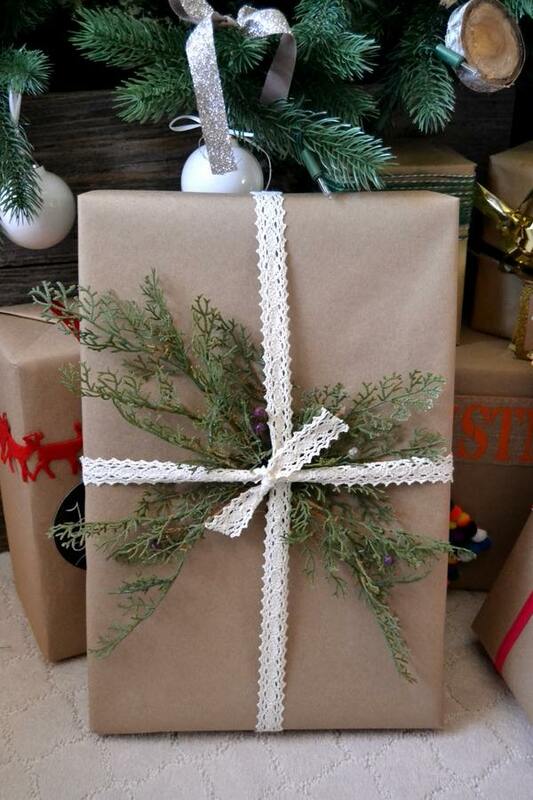 Burlap is another great material for Christmas gift wrapping. 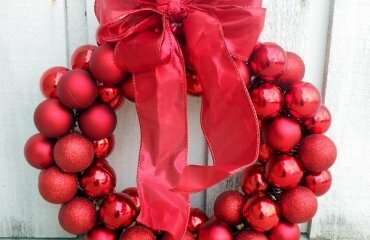 You can choose burlap fabric or burlap ribbons in neutral color or in traditional red, white, green colors. 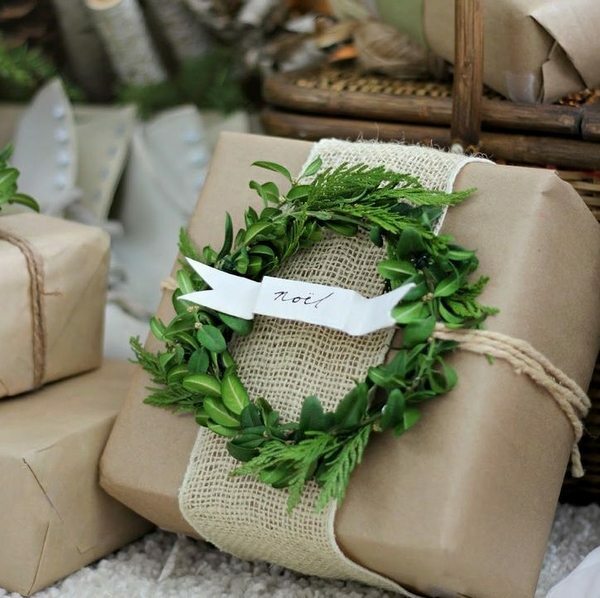 Burlap can be used not only to tie the gift, but it is a great material for the toppers. 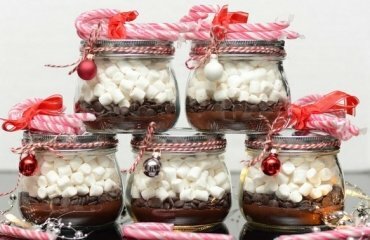 It works in a great way with pine cones, dry twigs, conifer twigs, paper, lace, etc. 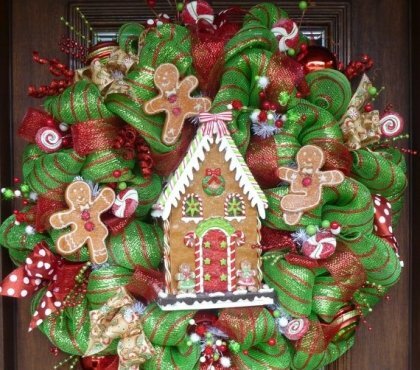 Herbs and slices of dried fruits, buttons and doilies, homemade Christmas cookies, salt dough decorations – all of these can be used for unique Christmas gift toppers and you will see many inspiring ideas in the gallery below. 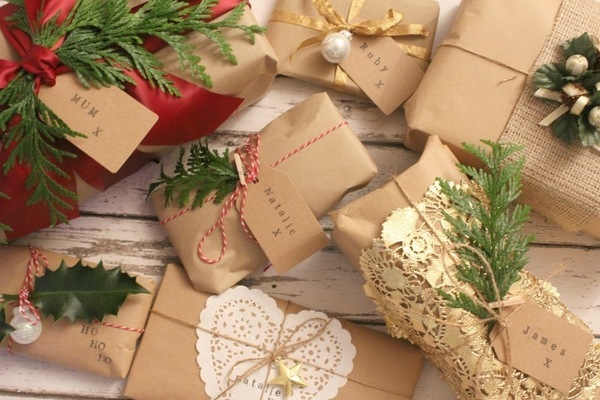 DIY Christmas gift wrapping ideas with natural materials can be a very pleasant and interesting pastime and at the same time it can be budget friendly and save you a significant amount of money. 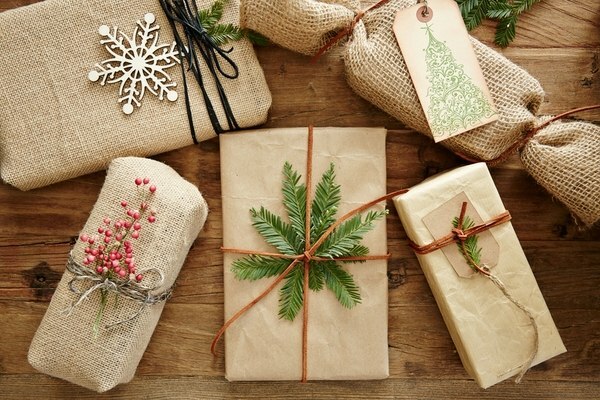 You all know that beautiful packaging is not very cheap so instead of a rather expensive, shiny gift wrap, why not give a chance to some of these more sustainable ideas with eco-friendly and natural materials? 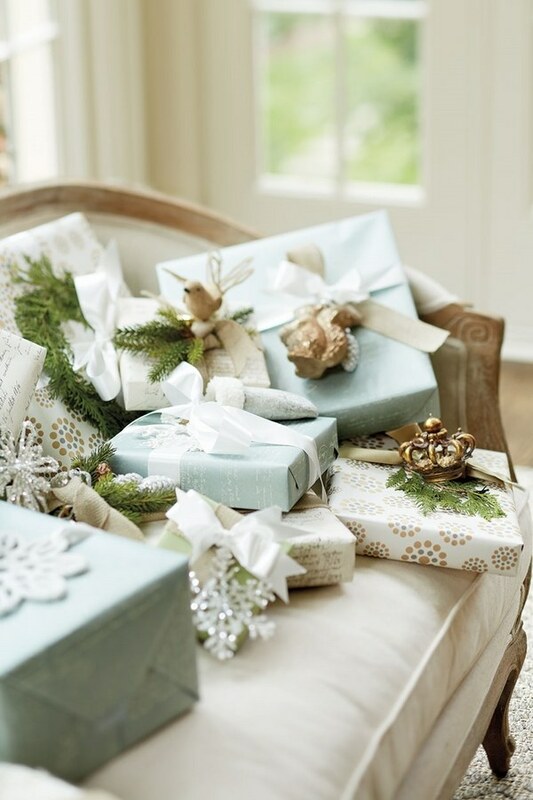 Gift wrapping does not require any special skills and even if you chose to put in a little bit more effort, the final result will be a pile of beautiful gifts to add to your Christmas decorations. 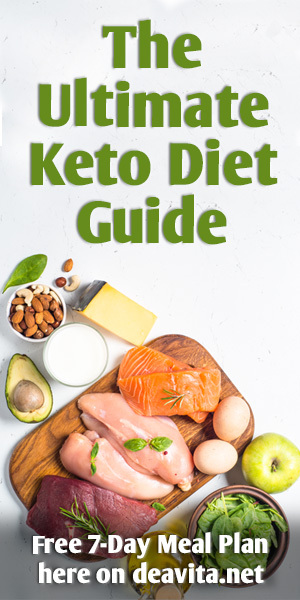 So, what do you need? 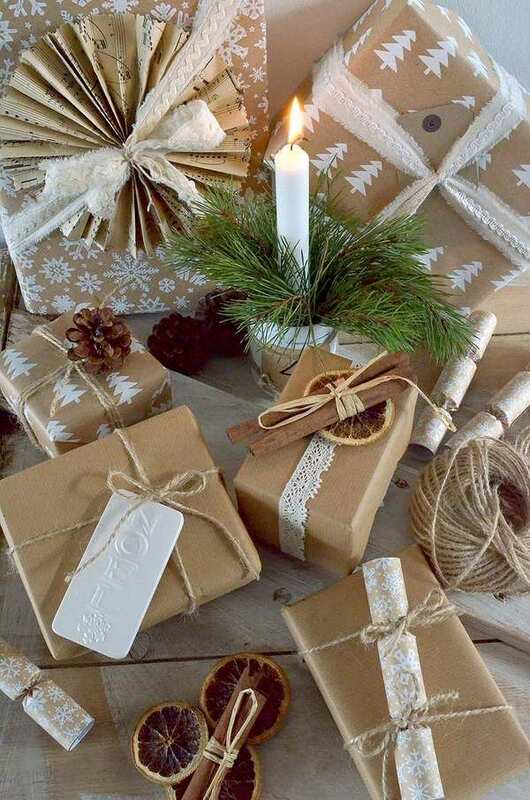 A large amount of paper for wrapping, rope, string, colored paper, pine cones, tree branches, fabric, lace and so on. In short – everything that can be found in your house or can be bought in a craft store or a bookshop for insignificant amount of money. 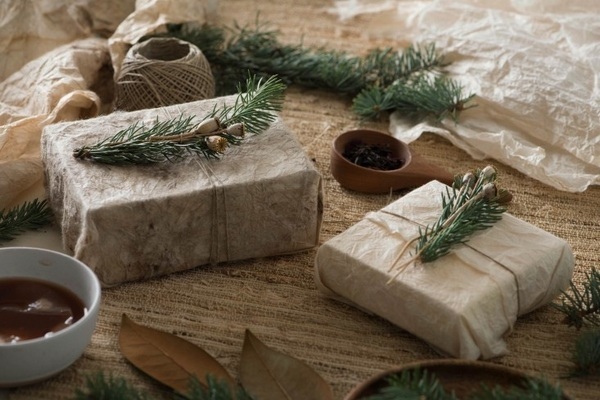 The first and most popular image of Christmas gift wrapping with natural materials that comes to mind is composition of cones and other natural materials. 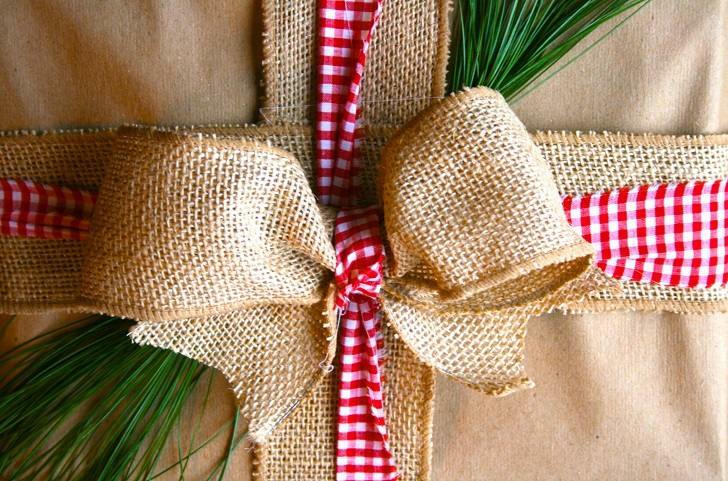 Using cones, spruce twigs, straw and natural rope, you can make a stylish package in a trendy eco-style. 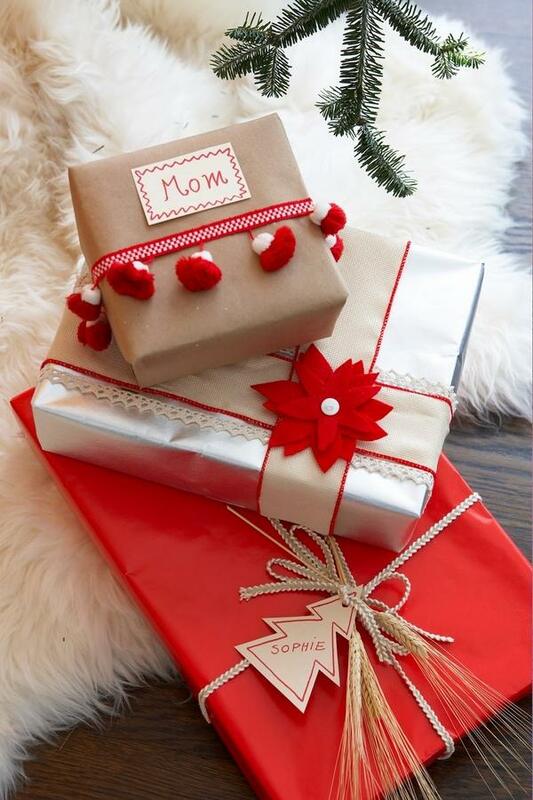 It is better to choose a very simple wrapping paper so that it served as a backdrop to your gift topper. 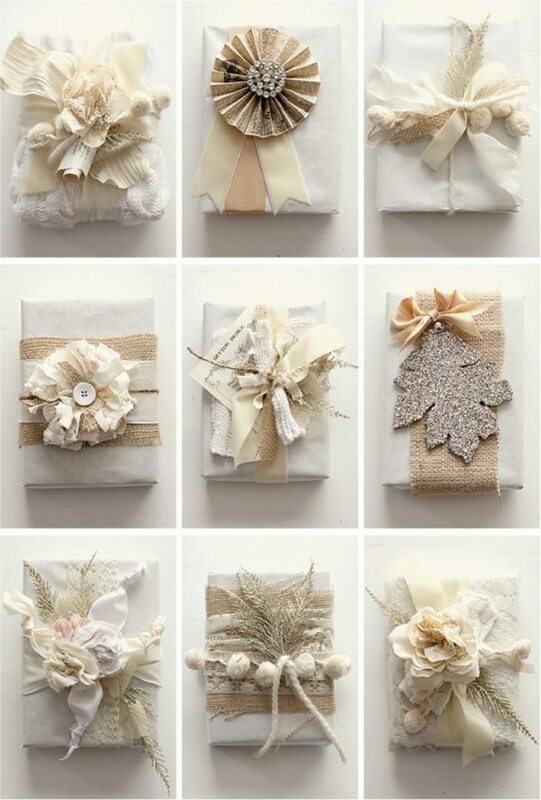 As you can see from the photos, the main idea is to create a simple paper wrap and beautiful eco-friendly composition instead of a bow. 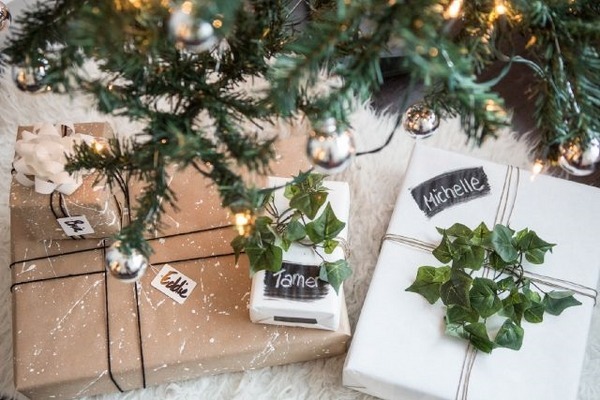 It will be a good idea if you wrap the gifts for all the family in one theme, color palette and materials adding small personal details to each individual gift. 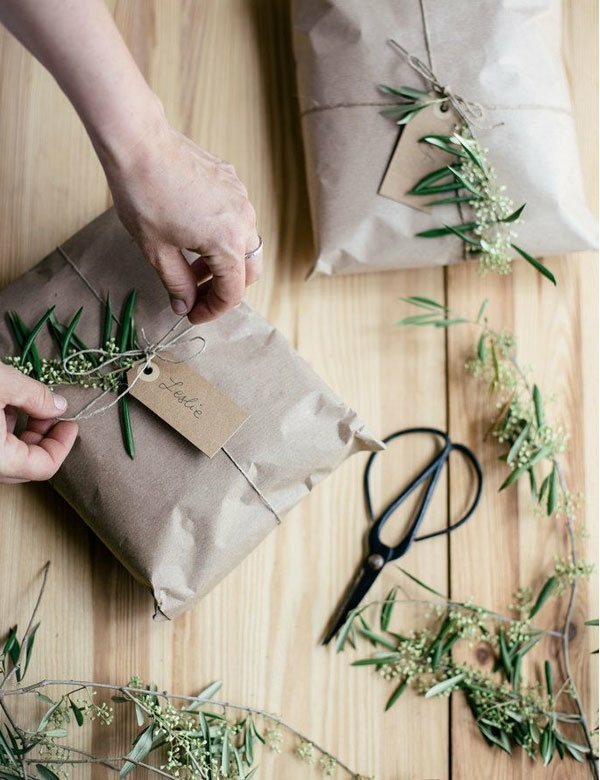 DIY Christmas gift wrapping ideas with natural materials are a great way to save the environment. 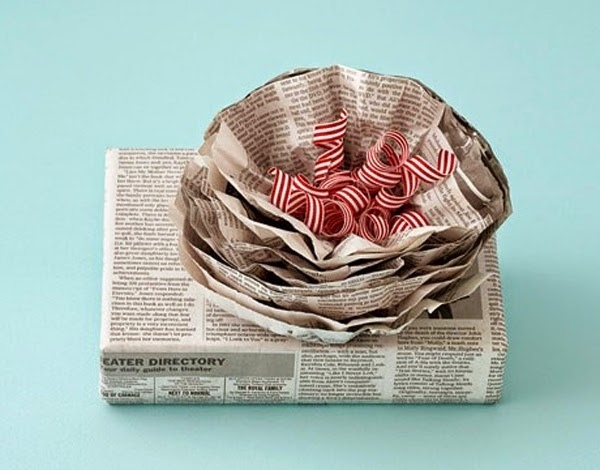 Brown paper, newspapers and music sheets are great wrapping ideas but what to do with Christmas gifts with unusual shape? 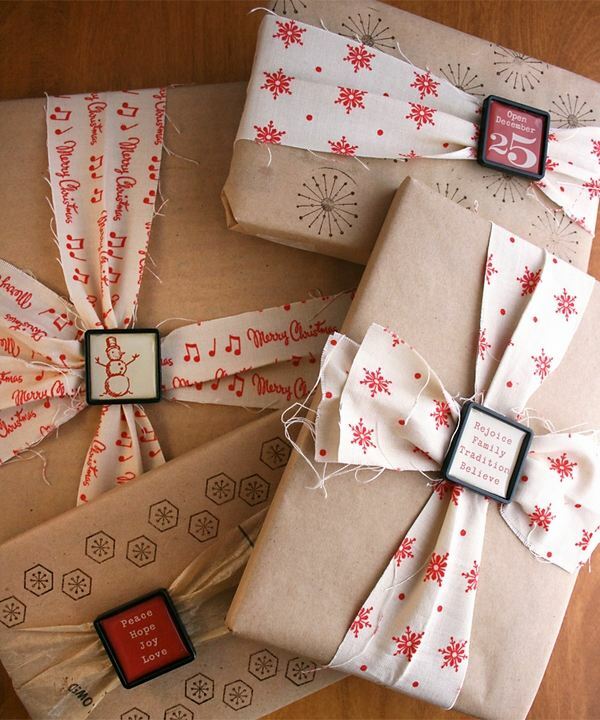 You can wrap them roughly in paper and tie a bow or opt for gift bags made of fabric. 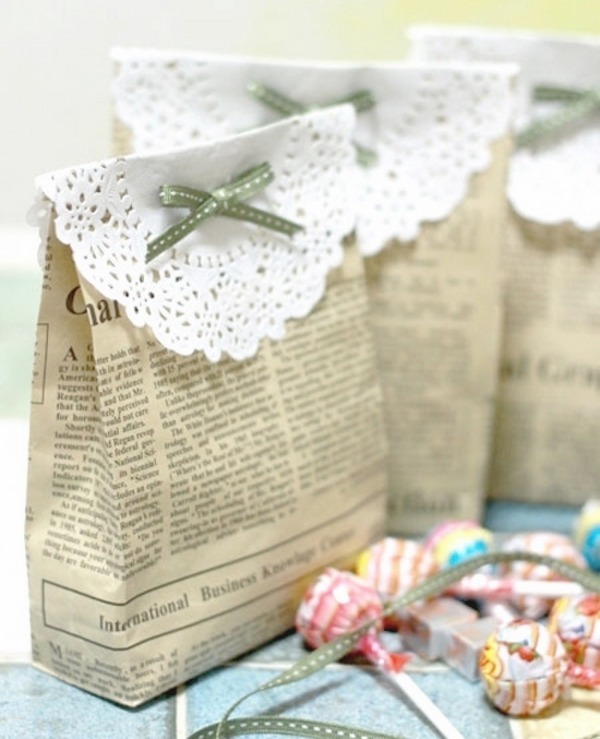 For example burlap bags are a great choice which will work with your rustic or vintage theme. 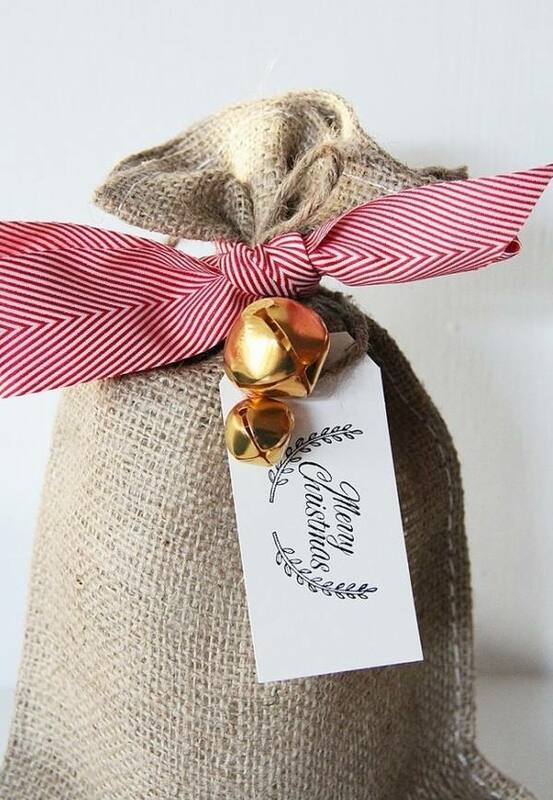 You can stamp the burlap Christmas bag with Christmas motifs, you can add strings and the best thing is that those are reusable and will not go into the dustbin once the Christmas gift is unwrapped. 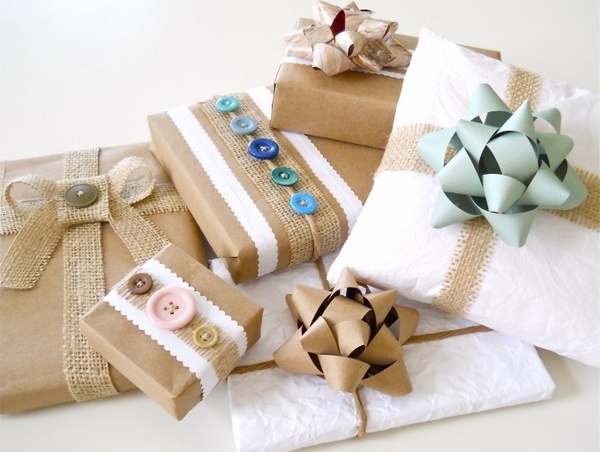 Like any other material – you can either buy textile gift wraps or craft them as a DIY project for the holidays. 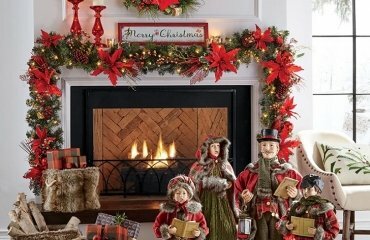 You can choose a different holiday print for every member of the family – stars, showmen, Santa Claus, reindeer – anything that will make them happy. 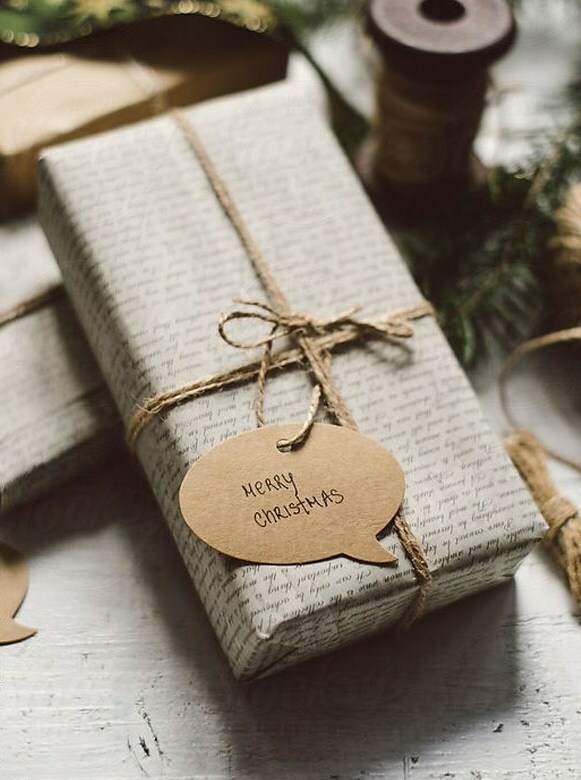 As you see, DIY Christmas gift wrapping ideas with natural materials give you the opportunity to show all your creativity, to make the holiday more magical, to make the people you love feel even more special and put your heart and soul in creating a unique Christmas atmosphere!